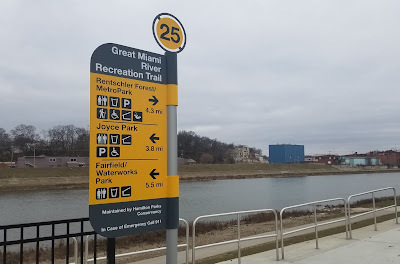 Just south of Downtown Hamilton, trail users can access the Great Miami River Recreation Trail from a small parking area off Neilan Boulevard. 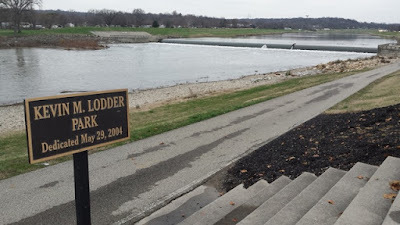 This triangle between the road and the river is called Lodder Park and is adjacent to Miami University’s Hamilton regional campus. An observation platform at the nearby low-head dam often hosts fishermen and birdwatchers. 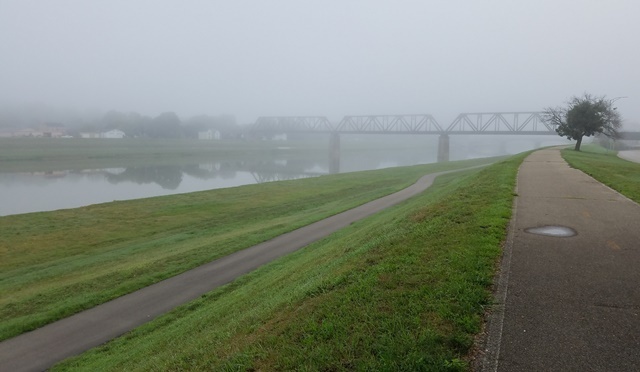 The trail north from here drops off the top of the levee and follows along the floodplain bench on the east side of the river. Thanks to the Miami Conservancy District’s century-old flood precautions, there is a wide grassy corridor for the river, now slowed to a long pool by the low dam. In the summer and fall, you may see rowers practicing on the water; year-round, this section nearly always hosts a number of birds, from Canada geese and mallards to grebes, cormorants, and herons. In recent years, immature and adult Bald Eagles have often been spotted soaring up and down the river corridor. The river valley begins to get more urbanized here, with noticeable housing and commercial development on the west bank. Traffic on the trail—both cyclists and runners—picks up as you get closer to downtown Hamilton. A little more than a half mile north of the dam, a staircase rises to the top of the levee at Knightsbridge Drive. Crossing Neilan Boulevard at the light here provides access to the Booker T. Washington Center, Foundation Field, and Vora Technology Park. Streetside sidewalks also connect into the residential neighborhoods along Front Street and surrounding Riverview Elementary School. As it continues northward, the Great Miami Trail ducks underneath the Columbia Bridge, the first river crossing (heading upstream) since US 27 in Ross eight miles to the south. The trail divides here: the right fork heads uphill into downtown Hamilton, while the left fork declines to the river’s lowest bench and continues along the water’s edge. The upper path brings you to the crest of the levee, where a sidewalk exits the trail to the right. This sidewalk leads south to the intersection of Neilan Boulevard and Pershing Avenue (SR 128). Turning left here (across Neilan Boulevard) leads you into the sidewalks of the Second Ward neighborhood of Hamilton. A sidewalk to your right crosses the Columbia Bridge and connects to a paved trail on the west side of the river. Alternatively, after crossing the bridge, you can continue across B Street and up New London Road to Veterans Park. This medium-sized city park includes a reservable meeting lodge, dog park, and commanding views of Downtown Hamilton. Following the upper branch of the trail to the north leads you under a CSX railroad bridge (also the route of Amtrak’s Chicago-to-DC Cardinal) and past the remarkable Fitton Center for Creative Arts. As you pass the rear of the Fitton Center, the trail bends to the right and terminates at the Butler County Fire Memorial statue. Just before you leave the trail, a set of stairs descends the levee to the lower trail along the river. 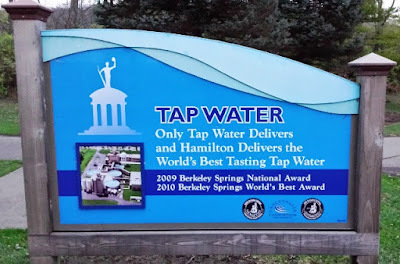 At the trailhead there are a water fountain and seating available adjacent to the recently-restored Soldiers, Sailors, and Pioneers Monument. From the trailhead, turn left along Monument Avenue to High Street. Within three blocks to either your left (west) or right (east), there are multiple options for food and drinks along the High-Main Corridor. 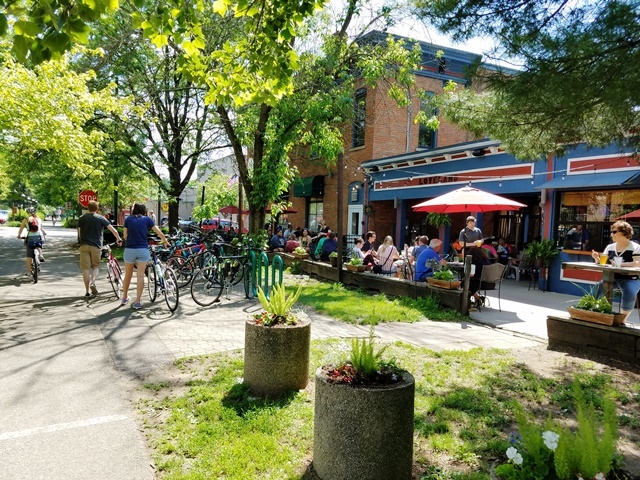 The Hamilton Welcome Center is located nearby at #1 High Street. As you explore downtown, keep an eye out for bronze plaques on some buildings – these indicate the maximum water level during the catastrophic 1913 flood of the Great Miami River. 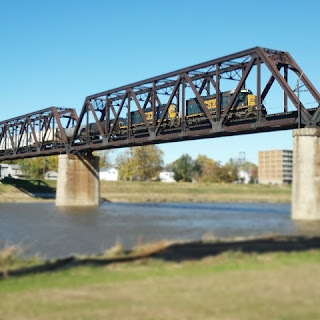 In our next installment, we’ll head across to the north side of High Street and visit Marcum Park and the RiversEdge Amphitheater, then return to the GMRRT and continue north along the river. Until then, get outside and ramble on! Rails to Trails Conservancy recently published a "best-of" list for trails in the United States. Ohio is represented on the rail-trail roll call by the impressive Little Miami Scenic Trail. Stretching nearly 80 miles from Springfield to the eastern outskirts of Cincinnati, this state-maintained (it's actually a linear State Park!) paved trail offers walkers, bikers, hikers, and families an easily accessed and accessible recreational facility. Trail towns such as Milford, Loveland (pictured below), and Xenia own their position and cater to trail users with restaurants, breweries, coffee shops, bike repair facilities, and more located on or near the path. 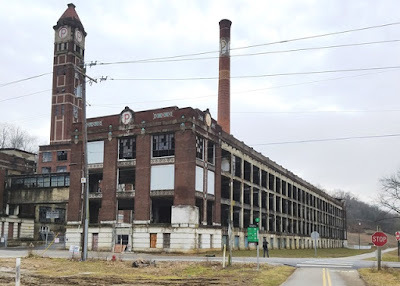 In addition to the adjacent Little Miami State and National Scenic River, sights along the trail range from the historic Peters Cartridge factory at Kings Mills to the skyscraping roller coasters of Mason's Kings Island amusement park. 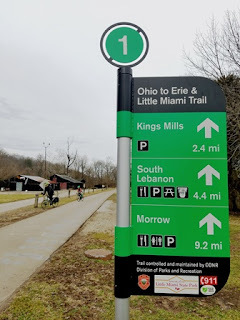 We here at the Cincinnati Rambler will certainly have much more digital ink to spill about the Little Miami Trail in the future - it's concurrence with seven other long-distance trails, being part of the largest network of paved off-road pathways in the United States, the soon-to-be-completed connection to Downtown Cincinnati, a cross-county network of trails linking to the Great Miami River corridor - but for now, I encourage you to grab family and friends and get outside on one of the best trails in the country, right in our backyard! 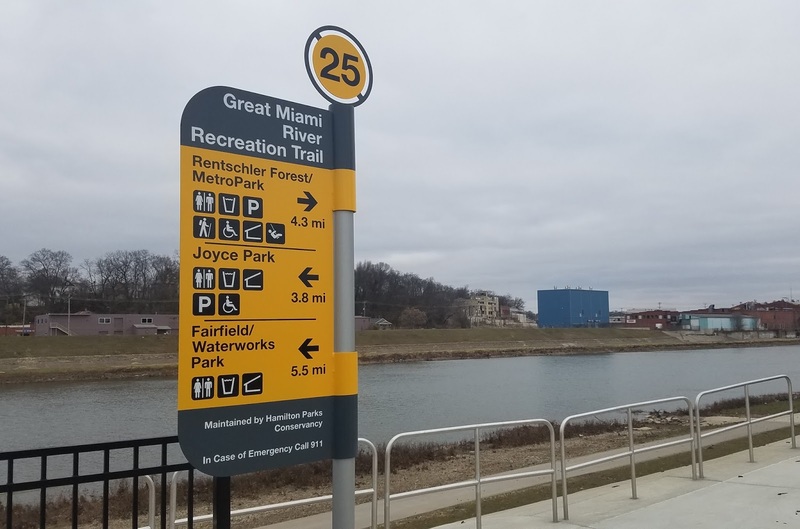 The second installment of our series on the Great Miami River Recreation Trail begins at the southern edge of Hamilton at the Joyce Park trailhead. The discussion of our previous hike from Fairfield's Waterworks Park can be found here. Segment Two runs northward to Lodder Park near Miami University Hamilton, a one-way distance of two miles. As with the other segments of the GMRRT, the trail is paved, well-maintained, and easily accessible for strollers and wheelchair users. 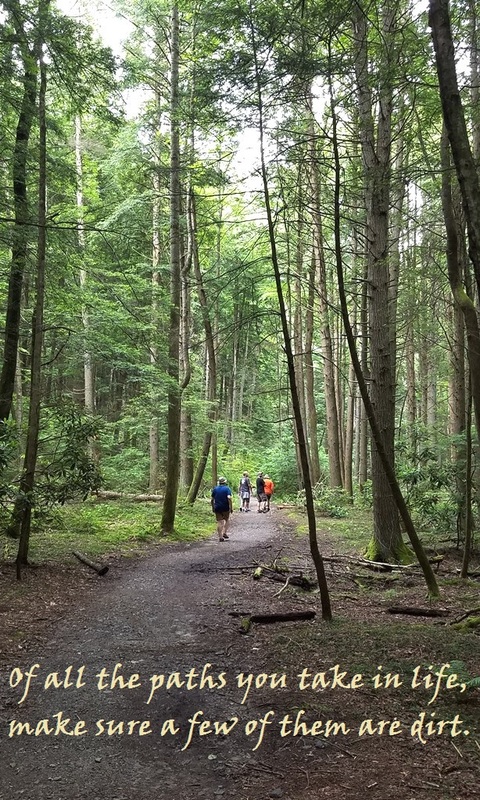 In 2016, the North Country Trail Association (NCTA) hosted a hiking challenge: everyone who completed 100 miles on the North Country National Scenic Trail within the year would receive a commemorative patch and certificate. The specific mileage was chosen to honor the 100th anniversary of the US National Park Service. Living nearby the NCNST, which is coincident with the Buckeye Trail through much of Ohio, I decided to give it a go. I got my miles done in mid-December and earned my patch, but I often felt guilty for ditching the wife and kids just to achieve my goal. The next year, the NCTA renewed the challenge and we decided to tackle it together as a family. By the end of 2017, we had racked up a grand total of 13 miles. No patches for us! 2018 brings a new anniversary and a new pair of hiking challenges. 50 years ago, President Johnson signed the National Trails System Act, which allowed for the creation of long-distance gems such as the Appalachian Trail, the Pacific Crest Trail, numerous National Historic Trails, and of course the longest of them all, the 4600 mile North Country Trail. This year's challenges on the NCT include a 50-miler and a 100-miler. They run concurrently, so if you complete your 100 miles on the trail, you get both patches! I don't know yet how much I'll bring the kids along this year, but I'm certainly going for the prize. 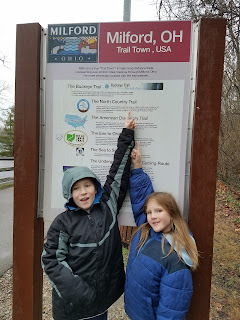 While much of the NCT/Buckeye Trail nearest to me is paved, I may also seek out some natural surface trails to coincide with the 52 Hike Challenge. Outdoor multitasking at its finest! Are you up for the task? As the NCTA says, Your Adventure Starts Nearby. Sign up for the challenge here and see you on the trail! The new year bends our thoughts and actions toward fresh starts, often with some type of physical improvement in mind. 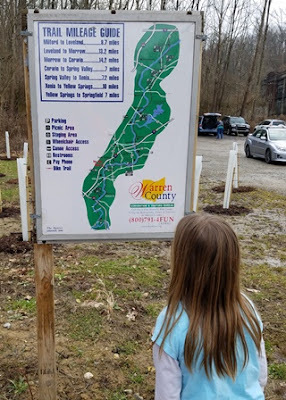 A fellow blogger of the outdoors recently posted about the 52 Hike Challenge. The organizers of the challenge encourage people to get outside and discover the nature nearby, whether urban or wilderness. At its core, the 52 Hike Challenge dares participants to average one hike a week for a year, although the "rules" are very loose. 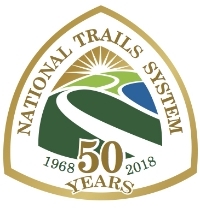 Tracking logs and a list of trails in each state are available on the 52 Hike website; free registration is required to access the resources. Neil Brennen at A Taste for the Woods has proposed his own parameters for what qualifies as a "hike": minimum distance of one mile, minimum duration of 45 minutes, and natural surface trails only. I like the one-mile and dirt path requirements; many of the trails around Cincinnati are paved, so finding my way to natural surfaces will take a little effort. I think the duration can be left open-ended: different folks participate differently in the outdoors, so I'm not sure a time limit makes much a difference. Hike your own hike, as the saying goes. I'm in for the challenge; how about you? What qualifies as a hike in your mind? 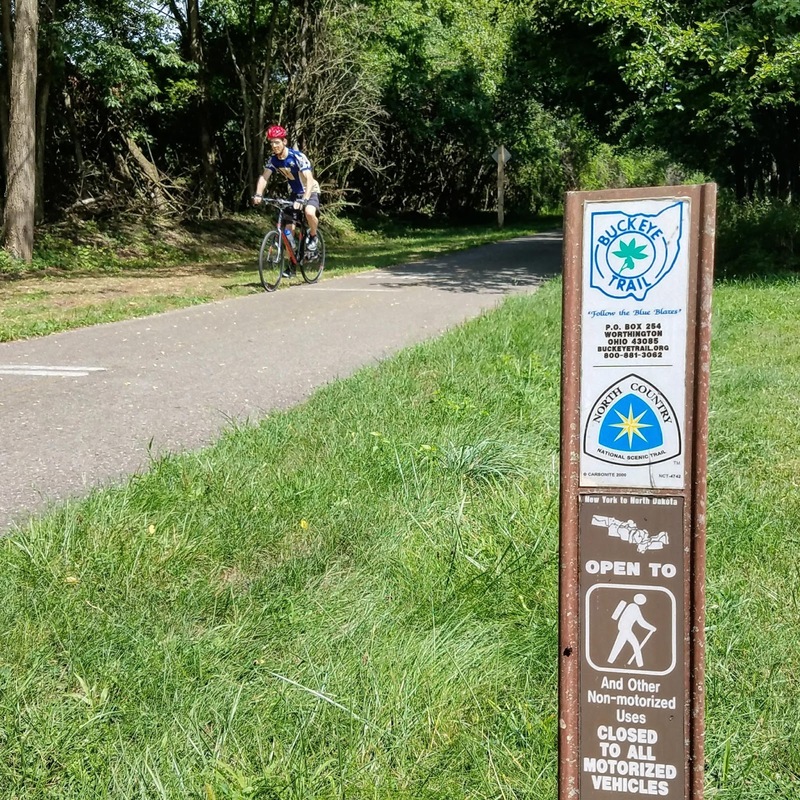 Stretching 75 miles through southwestern Ohio, the Great Miami River Recreation Trail offers outdoor recreation opportunities for trail users of all abilities. 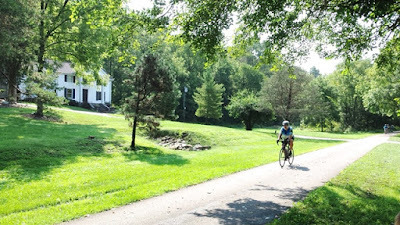 The trail extends from Fairfield through Hamilton and Dayton north to Piqua, paralleling its namesake river and Interstate 75. There are two gaps in the trail in Butler County, but plenty of enjoyment can be had while waiting for the final connections to be made. For our first posts of 2018, we'll spotlight the GMRRT near Hamilton. 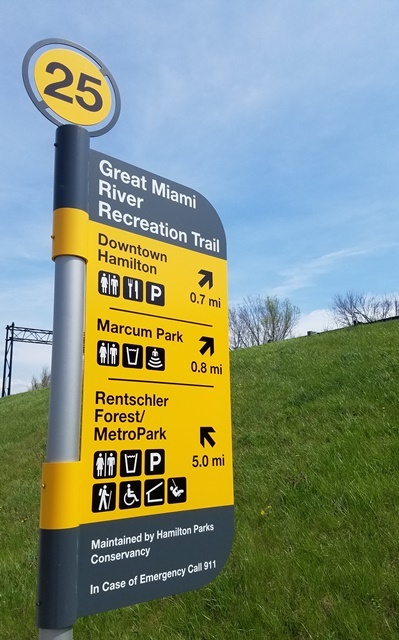 With multiple trailheads and inviting parklands adjacent to the trail, everyone can find a great outdoor experience along the banks of the Great Miami River. 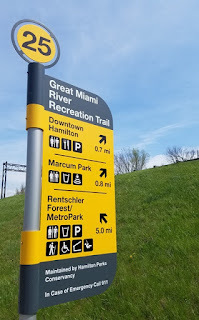 Our first trip on the Great Miami River Recreation Trail steps off from the trail’s current southern terminus in Fairfield’s Waterworks Park and heads north to Joyce Park in Hamilton. 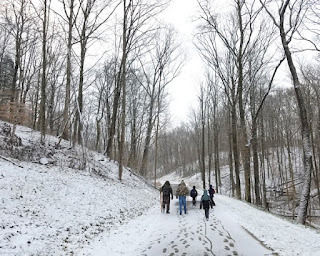 In January, when I planned a winter hike for Isaac’s Mountain Lion patrol, we were still in the midst of an abnormally warm Cincinnati winter. I was pleasantly surprised, therefore, when we woke up on an early March Saturday morning to a coverlet of snow, with a steady fall of thick flakes. 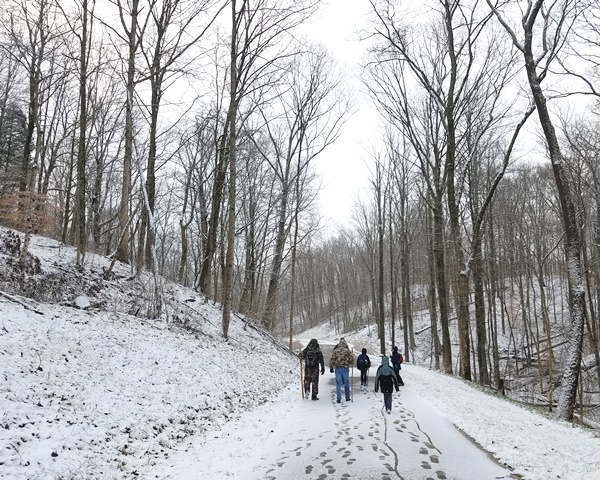 While the drive to East Fork State Park was dicey at times, the Williamsburg-to-Batavia Hike-Bike Trail provided a satisfying and simple three-mile hike despite the weather. Zeb Acuff battles the specter of obesity using the written word to encourage people of all abilities to get outdoors. 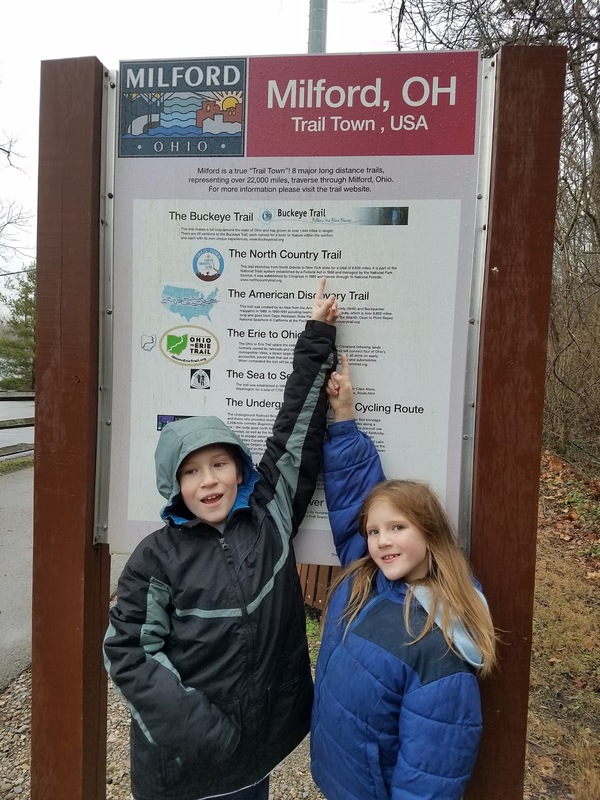 As the Cincinnati Rambler, he shares his passion for trails through family-focused features on recreation opportunities in southwest Ohio. Zeb tries to spend as much time as possible in nature, whether leading his kids on a birding expedition or camping with Trail Life USA. Since January 1, 2015, he has walked at least one mile a day, in all kinds of weather, throughout the United States. He sincerely believes that all families, including those living with limited mobility, can enjoy the benefits of walking together outside.